Welcome to Gentian Cottage. Built around 1780, in traditional Cotswold stone. Gentian Cottage is a detached beautifully newly restored cottage and has many character features, including wooden beams, exposed stone walls, painted wooden floors, window seats. Complementing these is a central fireplace, the cottage has modern facilities, including Broadband WIFI, large Samsung TV with DVD player and a selection of DVD's and a modern well equipped kitchen/diner with Nespresso Machine. The cottage also has an enclosed sun terrace, which looks out over the village of Blockley. Also a private parking space for one small car. The layout of the property makes Gentian Cottage an ideal retreat for a family with older children or for a group of friends or just maybe a large private romantic retreat for two. Gentian Cottage is perfectly located on a quiet lane, with views out over the rooftops and gardens of pretty Cotswold cottages. Despite the tranquil setting, the cottage is in the historic heart of Blockley, which is a peaceful, yet thriving village, with two pubs and a community owned village shop & café, and a historic Norman church. It is also the location where the BBC One 'Father Brown' mystery series is filmed. I am married with 2 growing up very quickly teenage daughters. Born in Essex. Spent 15 years in Investment Banking in Canary Wharf, London. Moved to the South of France in 2004 with my family. Returned to the UK in 2010 and relocated to the Cotswolds. My passion is interior design, Shabby Chic crossed with a little bit of French flair. I also love to travel and enjoy visiting our local Cotswold villages at the weekend. I also own and run "Boutique Chic" in the Heart of Chipping Campden (Jacinabox Cottage). Roll top victorian bath with claw feet. Separate power shower. A set of towels (Hand & Bath) are provided per guest. For longer stays of more than 7 nights additional towels will be provided. Private parking space for 1 small car. Also there is plenty of parking along the quiet lane with no restrictions. A set of towels (Hand & Bath) are provided per guest. For longer stays more than 7 nights additional towels will be provivided. A small quantity of initial consumables are provided (dishwasher tablets, kitchen towel, toilet tissue etc) however, you should not expect the quantity of provisions to be sufficient for your stay. Nespresso Machine Microwave Kettle, Toaster Plenty of pots and pans Gentian Cottage is Self Catering Accommodation. Older Children 4 years plus are welcome at Gentian Cottage. Also we do accept babies up until the age of 12 months old. Gentian Cottage is Self Catering Accommodation, however for a warm welcome guests are provided with tea including a variety of herbal teas, coffee, sugar, milk. A small quantity of initial consumables are provided for your convenience (e.g. coffee, tea, sugar, dishwasher tablets, kitchen towel, toilet tissue etc) however, you should not expect the quantity of these provisions to be sufficient for the duration of your stay. A set of towels (Hand & Bath) are provided per guest. For longer stays of more than 7 nights additional towels will be provided. Ideal for a few days away in beautiful Cotswold village. Best to park in the lane below as the parking space by the cottage is too small for an average size car. A perfect little gem hidden away in a corner of Blockley, which is itself pretty and most welcoming. We found everything we wanted for a relaxed and most comfortable stay. It is a convenient base for sightseeing and a delightful retreat at the end of the day. We will definitely return. Wow, what a stunning cottage. Up a tiny lane, you find this little gem. As soon as you walk in, you feel at home, with the lovely wooden floors, fab decor and quaintness of this cottage. The kitchen was well equipped with everything you'd need. We also had left a cake and could bottle of fizz, which is a nice touch. The lounge has a lovely comfy sofa and a really nice place to relax. The bedrooms are well proportioned and the beds were very comfortable. A good night's sleep was had by all. Just wished we could have stayed longer. Cant wait to go back would love christmas there the people in the village are so friendly only minutes away from other cotswold villages to explore we would highly reccomend !!! This is a perfectly LOVELY cottage. The layout is charming, the decor is fun, the location is idyllic, the beds are among the most comfortable we have ever slept on, and it's unbelievably quiet. Blockley is our favorite Cotswold village. We definitely recommend this place to anyone who wants peace and comfort while exploring the region. 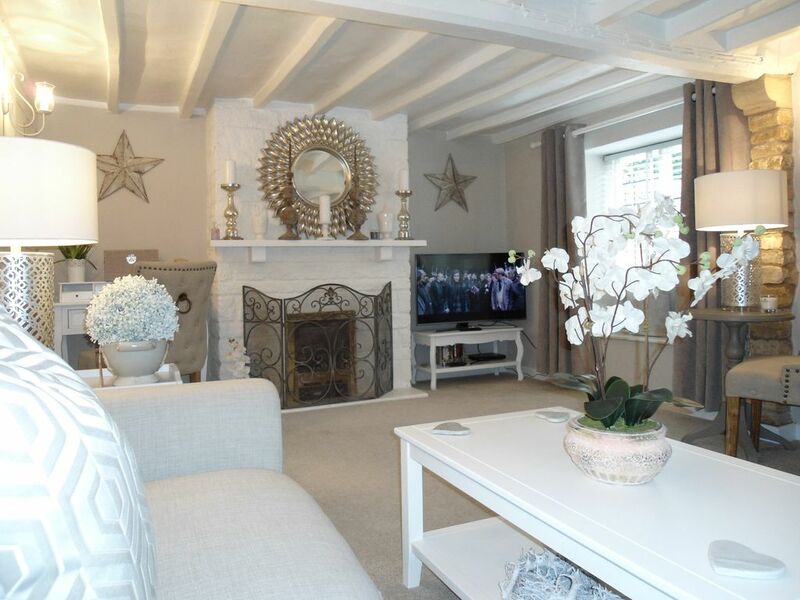 The cottage was very "boutique chic" It was elegantly decorated and furnished. The cottage was well equipped. It was in a good location with stunning scenery all around. Children welcome over the age of 4 years of age Strictly No Smoking Cottage 1 small dog maybe accepted at a charge (summer months ONLY) - please enquire before confirming your booking to see if acceptable with Owners.